The average person produces about ~100 watts per hour, so to power New York for an hour it would take ~458 Megawatts which would be the equivalent of the same power as 534 people at 2000 calories per day for a year, this is also the equivalent of nearly 400 tons of TNT and that's only an hour of powering New York, powering New York for a year would take about 34,570,000 tons of TNT as electric, also powering New York for a year is nearly the same as two castle bravo nuclear bomb! Now how much does one human produce in a year, of course if you are a weight lifter or a body builder than you would probably produce more but if you're just the normal 2000 calorie guy/gal than you would produce 857,750 watts per year, that is about the same as 2/3 of a ton of TNT or about enough to power a electric iron for 700 hours or enough to travel ~5200Km on a Tesla Model S (2013)! 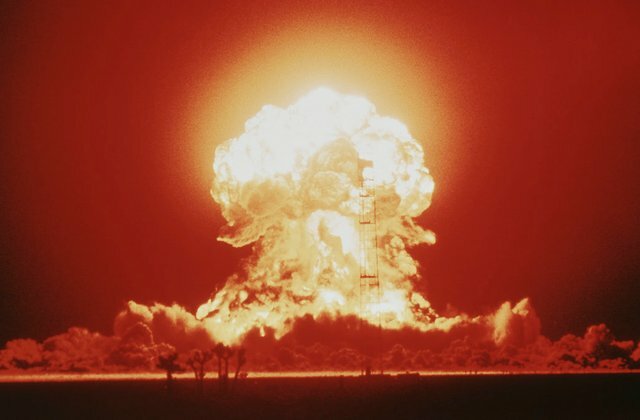 The fat man bomb which was exploded over Japan produced the same blast as 21 kilotons of TNT though it was a lot less powerful than the castle bravo bomb it still packs perhaps a little too much punch but how many people years worth of power would be the equivalent? Well the answer is ~28767 people's energy for one year, that's enough to power New York for more than 2 days (WOW) imagine that it could actually power New York for 2 days (i know right New York uses quite a lot of power) that is 24,406 Megawatts! Now, how much is 1000 people years of calories in energy? Well it's enough to displace ~73,800 tons of soil, and also enough to power an average home for 941 months or 78 years, with the average consumption of a American home being 911 kilowatt hours per month the electricity generated by 1000 people for one year is ~730,000,000 Kcals or 857,750,000 watts (857.75 Megawatts), for comparison a nuclear reactor the size of Fukushima nuclear reactor in Japan before it blew up, produced 760 megawatts per reactor containment! Now, something we've all wondered, how many tons of TNT would it take to blow up Mount Everest? Come on admit haven't you been wondering and wondering, How many tons of TNT would it take to blow up Mount Everest? You haven't? Oh well than... We would need about 20,000 million tons of TNT amount so now you know! That's all for today! I've spent quite a while writing this article so of you could resteem it and click the like button and perhaps follow me on steemit, I would really appreciate it!! But if you don't i am still really glad your here! Thanks for reading!! !